Yotam Ottolenghi is a well known celebrity chef, he owns multiple restaurants in London and has written several highly regarded cook books. I'm reviewing specifically his chocolate cake, a flour-less cake which could also be described as death by chocolate. It has a light dusting of chocolate powder and is truly delicious. It's quite complex to make if you chose to, you have to split the mixture up and then cook one section and let that section cool and then cook the rest. But never fear this also buyable in his restaurant, Ottolenghi's. The restaurant in Islington is well worth a visit for the chocolate cake if nothing else. However if you are in the more healthy line ( I doubt it if you're reading this review) Ottolenghi' does a huge range of healthy goodies too! Why? 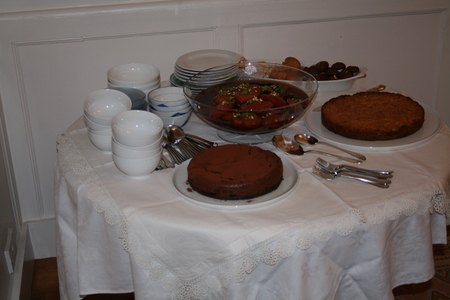 The food, particularly the cake is lovely!